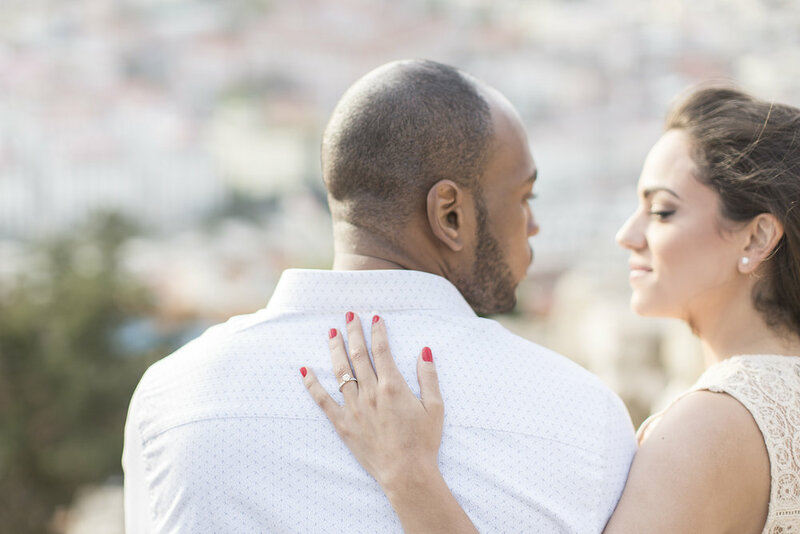 Sonia and Jean came from New York and found in Lisbon the perfect place for their couple's session before the big day! The Castle of São Jorge, once a strategic military point, couldn't be better located, with its many battlements, stairs, staircases... and the view! The incredible view over the city, the bridge, the river, the other shore. An incredible couple, a perfect setting and a unique light, however, preparing a photo shoot in a distant country may not be an easy task! There is the trip and the suitcases, deciding what to take, not knowing the places, not knowing what to wear and to put on, and so many other little things that can worry you and leave you on the edge of changing your mind. But don't do it, keep reading and I promise to leave you with some tricks for an even more incredible session anywhere in the world... if it's in Lisbon, the better! 1. Drink plenty of water on the eve of the session: it will make your skin look better and your hair and eyes brighter! 2. If traveling between different time zones, ensure that before the session you have a good night's sleep. 3. Ask your photographer to recommend you someone who can take care of your hair and makeup and even prepare flowers if you want to use them as an accessory. 4. Always bring plan B if you decide to use high heels during your session. 5. Try to wear clothes that don't crease a lot or consider using a local laundry to take care of your clothes. 6. If you travel to an unfamiliar place ask your photographer for a suggestion of places to photograph, mentioning the ideas you already had for your session. This last tip seems super pretentious, but as I usually say, if you want beautiful photographs and good memories, I want you to have so beautifully spectacular photographs that neither I nor you want to stop looking at them! Any questions or if you need help preparing your session, I'm here! As for Sonia and Jean, guessing by this session, we foresee an incredible day happening at October, on the other side of the ocean! Another incredible shoot for the incredible Flytographer!